NAMM 2009 took place in Anaheim, California. January 15-18, 2009. The show is packed with over 1500 exhibitor booths. Approx 90,000 are expected to attend. 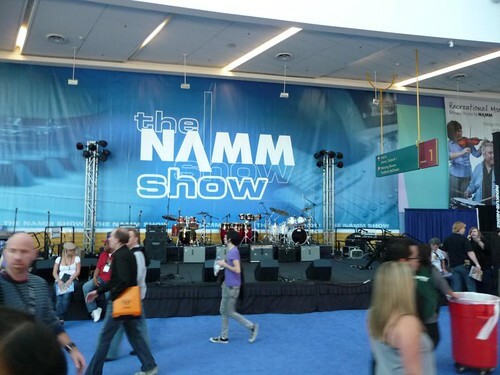 There's a rumor that the NAMM 2010 show may move to the Los Angeles Convention Center. That would be great news for the City of Los Angeles. I would prefer to see it held in Los Angeles. The LA Convention Center is larger and has been expanded to accomodate large conventions like NAMM. At the show you will see all the music equipment and related components, basically anything that has to do with music you can find it at NAMM. The people watching and photo opportunities are great. Here's DBZ Guitars/Diamond who had some models at their booth taking pictures with those in attendance. That's me in the center. Here's a picture of the stage where bands perform during the convention. The LA Times has a great interview with the head of NAMM, Joe Lamond. The story mentions NAMM did a survey and showed that 82% of people who don't play an instrument wish they did. Wow that's a huge market that Guitar Hero and RockBand have targetted.